As the working population ages, occupational health advice can help people to stay in work for longer. Occupational health nurses Christine Long and Elizabeth Griffiths look at the effect of ageing on older nurses. The Boorman review recommends “that all NHS organisations provide staff health and wellbeing services that are centred on prevention (of both work-related and lifestyle-influenced ill health), are fully aligned with wider public health policies and initiatives, and are seen as a real and tangible benefit of working in the NHS”. The promotion of Department of Health (DH) initiatives – for example, tackling obesity, smoking and improving mental health within an OH environment – is in line with the NHS legislative framework to improve healthcare outcomes within this population (DH, 2010). The coalition Government is committed to promoting actions to reduce health inequalities, with a focus on improving public health and empowering patient and health professionals to make decisions regarding their own health and wellbeing. 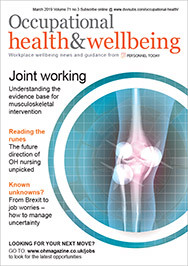 The primary author of this article, Christine Long, is employed as a newly qualified OH adviser within the OH department in a large acute NHS trust in South-East England. A comprehensive service is provided to NHS employees and private businesses. While undertaking an assessment to identify the health needs of the organisation, it became apparent from the available data that the average age of the workforce is steadily increasing. The labour market statistics for the South-East (Office for National Statistics, 2010) show that more than half of the employed population is over the age of 35, with half of those workers over 50 years old. This confirms an ageing workforce. Indeed, in the South-East, nearly one-third of the workforce is aged 50 years or over. With many of our employees living within this area, these figures were significant in planning OH provision. There is good evidence that the age of the global population is increasing and it is predicted that by 2020 almost one-third of the workforce could be more than 50 years old (Department for Work and Pensions, 2009). The World Health Organisation (WHO) defines an older worker as one who is aged between 55 and 70 years. It describes the ageing population as a success for public health policy and socioeconomic development, but acknowledges that this poses further societal challenges as adaptations will be necessary to ensure the health of this population and their functional capacity, not only in the workplace but in society in general. The WHO supports Active Ageing, a campaign aimed at extending the healthy life expectancy and quality of life, allowing people to reach their full potential for physical, social and mental wellbeing. The NHS is Europe’s largest employer, and the impact of its ageing workforce could have significant consequences for the organisation. “Healthy work challenges and opportunities to 2030” (Bupa, 2009) warns that workplaces are going to face health-related challenges in the years to come, with older employees working longer but coping with ill health. It is vital, therefore, that employers invest in interventions to support older workers and key public health goals. OH nurses are ideally placed to carry these interventions forward. Recent changes in legislation may also result in staff working longer. The abolition of the default retirement age will give people the choice to continue employment (Acas, 2011). The Equality Act 2010 states that it is unlawful to discriminate against an employee because of age. Looking at various articles, there seems to be some common themes that emerge with a particular focus on nurses. Palmer et al (2007) describe the ageing workforce as the “demographic time bomb” looming large. Even in these difficult economic times, there may still be a gap in the labour market. The number of nurses leaving the profession or choosing early retirement with no younger workforce to replace them might have the same impact. Schluter et al (2011) point out that more than one-third of nurses were aged 50 years or over and nearly half of those care for others outside the workplace. The health needs of this ageing nursing workforce are varied and OH departments need to work collaboratively to fulfil those needs. As discussed in Dame Carol Black’s 2008 report “Working for a healthier tomorrow”, OH needs to extend its remit beyond the usual health assessment for pre-employment and dealing with sickness absence, to maintaining fitness for work and implementing public health policies relating to work and wellbeing. Therefore, it is important that employers realise the value of the ageing worker with regard to the experience, skills and stability they can bring to the workplace. OH has an important role to play here and one that will become increasingly important in the future. The physical capability to work decreases between the ages of 50 and 60, and this can result in low self-esteem and feelings of “not being able to do the job”. The Faculty of Occupational Medicine (FOM) (2010) suggests a focus on what an employee can do rather than what they cannot do. We must look at employees’ work ability – the ability of an employee to perform their job, taking into account work demands, individual health conditions and mental health resources. Older workers may require some adjustments and adequate training to continue to work competently and safely. They also need to avoid overworking, which can lead to exhaustion. This can all be achieved with proper management and collaboration between the employee, management and OH (Wray et al, 2007). Gabrielle et al (2008) point out that an ageing female workforce can experience specific changes in the middle years, such as the menopause and the beginnings of chronic disease. This may be particularly significant in an NHS setting, as the nursing workforce is getting older and this group of nurses is under increasing pressure to try to maintain a good work-life balance. The TUC has accepted that the menopause can result in physical and psychological problems, but this is not always recognised by employers. Similarly, the British Occupational Health Research Foundation revealed in 2011 that 70% of women experienced distressing symptoms associated with the menopause. Of those, nearly half stated that these symptoms affected their work. Many felt unable to approach their managers because of embarrassment or feeling that it was not a work issue. This shows that awareness and support from the manager and employer are helpful. OH needs to collaborate with other departments, such as HR, to promote a greater awareness regarding the menopause among managers. The provision and access to support materials for women should be provided by OH. Flexible working is an option that can accommodate this health need, but it is important that these nurses feel valued and supported however many hours they work. This type of flexibility can benefit both employee and employer, enabling the retention of experienced staff (Becker et al, 2010). There is also evidence of increased sickness absence in this ageing population because of an increase in musculoskeletal injuries. Muscle strength is lost as a result of ageing, which can result in injury. Early detection and rehabilitation are vital in getting a person back to work. The rehabilitation process requires the participation of the individual, supported by the OH department and the employer. The Health and Safety Executive (HSE) framework recommends vocational rehabilitation through early identification of vulnerable employees by using health checks and fit-for-work assessments following sickness absence. We know that identifying those at high risk of workplace illness or disability and implementing early intervention – for example, referral for treatment or workplace adjustments – is effective at preventing sickness absence. Physical activity should also be encouraged by OH as this can improve and postpone the effects of ageing on muscle (Baptista and Vaz, 2009). OH needs to be proactive in considering the health requirements of the older nurse to reduce the risk of ill health and disability. Early intervention and the promotion of public health issues can reduce the risks associated with ageing. The importance of health promotion both for individuals and the organisation might include training, easy access to care, health checks and screening. The HSE recommends workplace assessments to enable early detection of health problems. OH nurses need to understand the issues of the ageing population to provide advice about workplace options and the availability of flexible working, and involve HR to help provide information regarding retirement, pensions and financial planning. Ageing is a contemporary issue that needs to be addressed; the trend is that the workforce will continue to age, with an expected shortfall in nurses. In order to retain the older nurse, the workplace needs to focus on retention strategies and incentives tailored to meet the needs of this group of skilled workers. Christine Long is an OH nurse working at Darenth Valley Hospital and Elizabeth Griffiths is pathway leader for the OH strand of the Special Community Public Health Nursing (SCPHN) course at Brunel University. Acas (2011). Working without the default retirement age: Guidance for employers. Baptista R, Vaz M (2009). “Muscle loss – strength training exercise can postpone or improve ageing effects on skeletal muscle”. Fisioterapia e Pesquisa; vol.16, no.4, pp.368-73. Becker S, McCutcheon H, Hegney D (2010). “Casualisation in the nursing workforce – the need to make it work”. Australian Journal of Advanced Nursing; vol.28, no.1, pp.45-51. Black C (2008). “Working for a healthier tomorrow”. Department for Work and Pensions. Boorman S (2009). “NHS health and wellbeing review”. Department of Health. British Occupational Health Research Foundation (2010). Women’s experience of working through the menopause. Bupa (2009). Health work opportunities and challenges to 2030. London. Department of Health (2010). “Liberating the NHS: Legislative framework and next steps”. Department for Work and Pensions (2009). Age isn’t an issue: An employer’s guide to a 21st century workforce. Faculty of Occupational Medicine (2010). Occupational Health Service Standards for Accreditation. Gabrielle S, Jackson D, Manix J (2008). “Older women nurses: health, ageing concerns and self-care strategies”. Journal of Advanced Nursing; vol.62, no.3, pp.316-325. Government Equalities Office (2010). Equality Act 2010: What do I need to know? Disability quick-start guide. Health and Safety Executive (2003). Job retention and vocational rehabilitation: The development and evaluation of a conceptual framework. Office for National Statistics. (2010) Labour Market Statistics. Palmer K, Cox R, Brown I (2007). Fitness for Work: The Medical Aspects (4th edition). Oxford; OUP. Schluter P, Turner C, Huntington A el at (2011). “Work-life balance and health: the nurses and midwives e-cohort study”. International Nursing Review; vol.58, pp.28-36. World Health Organisation (2002). Active Ageing: A policy framework. Wray J, Aspland J, Gibson H el al (2007). “Older nurses and midwives in the NHS”. Nursing Management – UK; vol.14, no.8, pp.26-30. Mrs S was a 58-year-old staff nurse who had been working for an NHS trust for 15 years. She was working full time in theatres and her shift pattern included night duty once every six weeks. She had recently been having some tests to establish whether or not she had diabetes. She had requested an appointment with her OH adviser following a women’s health promotion day that the OH department had run. Her attendance record was good, but she was getting worried about her ability to cope. Her elderly mother was also making increasing demands on her time. Mrs S was upset on her initial visit; she was distressed at the possibility of a diagnosis of diabetes and was also concerned about her weight, her current body mass index being 42. The risk of developing chronic disease increases with age, and obesity increases this risk. Mrs S was very stressed regarding her mother and felt that she would be unable to cope for much longer balancing her work with her commitments at home. During the visit, Mrs S informed the OH adviser that she was awaiting an appointment to see a consultant and a dietician. The trust has a policy for “fast tracking” staff working within the hospital and this service was offered and implemented, bringing her appointment forward by a month. This system helps to reduce sickness absence among staff, helps to get people back to work quicker and is cost effective. The OH department also implements a lifestyle programme as part of its health and wellbeing initiative. It was suggested that Mrs S discuss this when she attended her appointment with the dietician. This programme is designed to help clients address lifestyle problems, such as weight or exercise issues. The programme was created through the OH department working closely with healthcare professionals from other disciplines, such as the dietetics, cardiology, physiotherapy and diabetes services. The programme is free to trust staff and is available on a one-to-one or a small group basis. Mrs S was finding full-time working difficult because of her mother’s demands, especially at night. It was suggested that she discuss these problems with her manager to explore the possibility of working modified hours, including no night duties, until she had made suitable arrangements for her mother’s care. She had been in touch with social services and was waiting for an assessment and care package for her mother. It is important to look at a person’s workability and utilising this rather than negatively considering what they cannot do. Mrs S did not want to take absence from work but did require some adjustments to allow her to stay at work, which could be achieved through flexible working. The trust also offers a counselling service under an employee assistance programme. This was explained to Mrs S and she was given details of this service and the procedure for contacting it if she wished to pursue this option. By working together with Mrs S, her manager and other healthcare professionals, it was possible for the OH service to help keep Mrs S at work, which is better for her own health and beneficial to the trust as a positive outcome.